Rumour has it, our lips are 100 times more sensitive than our finger tips and they tend to dry out quickly due to the lack of sweat glands on the area. If this is true (which I don’t doubt), then we really ought to give them their worthy share of care and attention. Nobody wants dry cracked lips, and I don’t think any of us really like putting stuff on our skin without being able to pronounce half the ingredients on the packaging. Beauty and skin care products are so chemically laden these days it’s scary. Treat your lips to a healthy wholesome deep moisturising balm, straight from your own kitchen, and give the toxins a miss for a change! I think you’ll find this little recipe works wonders, particularly during the colder months when skin takes a harsh beating from the elements. 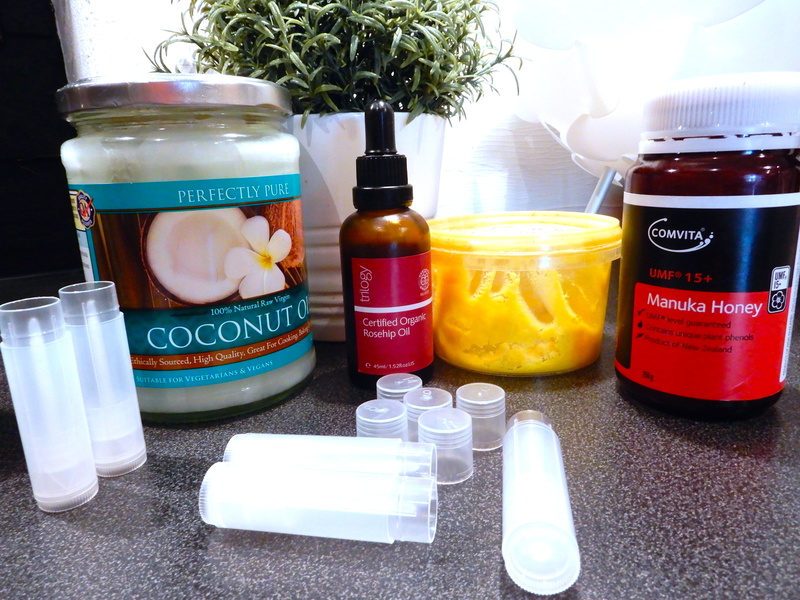 This simple lip balm recipe is far purer than most products you see in the shops – I’m open to adding to it, but it provides a very good basic balm with the hand full of ingredients below. Give it a try, see what you think! This is all pure, and better value for money than buying from the shop. Add all ingredients to a small mixing jug/bowl. Place the bowl into a pan of hot water to melt. You might want to give the beeswax a head start as it takes quite a while a while to melt – stick with it! If need be, put it on the hob for a couple of minutes by itself. Give the mixture a good stir until it runs smooth with no lumps of wax, use a spatula to help it along. Last but not least, add a few drops of peppermint oil and stir again. Carefully pour the melted mix into empty lip balm tubes (or small balm pot) – you’ll need to be fairly quick before the mixture starts to solidify. Voila!!! You have lip balms – just give them 5 mins or so then they’ll be good to go, along with your lips! These balms would also make good natural protectors on sensitive areas that burn easily in the sun. Beeswax: contains vitamin E, nourishes and moisturises, forms a protective layer. Manuka honey: I can’t stress just how powerful and beneficial this product is – Manuka honey has antibacterial and anti inflammatory properties (it is known to be more effective than antibiotics). You can apply Manuka honey to your skin neat from the jar – for a variety of topical treatments, and of course it works wonders on the inside too – take a teaspoon of the stuff raw now and again – especially when snuffles and colds are rampant. Peppermint: as well as being a calming scent, apparently, peppermint oil makes your lips look/feel a bit plumper, as well as smelling and tasting fresh – pucker up then! Shea butter: lots of vitamin E, great for elasticity and hydration. Coconut oil: deep moisturising and reduces inflammation. Rosehip oil: helps regenerate skin cells and tissue, smooths lines and wrinkles, moisturises, fades scars.